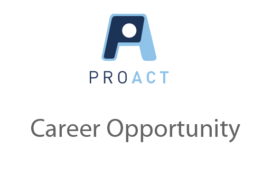 Job Posting - full time Vocational Specialist - Eagan - ProAct, Inc. Serving people with disabilities for more than 45 years. Requirements: *B.A. Degree in vocational rehabilitation or related field. 2 Years related experience and/or training or equivalent combination of education and experience. *Must be able to be CPR and 1st Aid Certified. Job Description: The primary focus of this position will be to provide job coaching for adults with disabilities at community jobs. Other requirements may include assisting with vocational assessments, work adjustment training and job development/placement. Coordinates client services in collaboration with team members and referring agencies. Assists individuals with job readiness and job seeking skills. Acts as a liaison between ProAct and future employers.